The Bohemian Reformation started in Prague in the second half of the 14th century. In that time Prague was not only the seat of the King of Bohemia but also of the Holy Roman Emperor (or King of the Romans). Prague was one of the Europe's largest cities and after Avignon, Rome and Paris was the city with the highest concentration of clergy in Western Christendom. 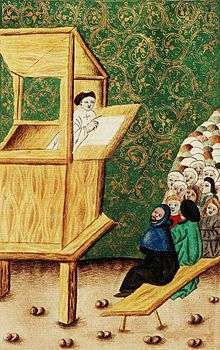 The beginnings of the Bohemian Reformation were closely related to the criticism of the lavish lifestyle of many priests. 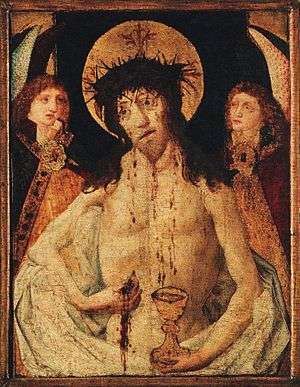 In the late 1370s and early 1380s the Prague university theologians and intellectuals called for the reform of the decadent priesthood in the spirit of emerging conciliarism, for education of unsatisfactorily educated priests, and for more frequent accepting of the Eucharist in the spirit of Devotio Moderna. The most significant representatives of the university reform movement were Henry of Bitterfeld (Heinrich von Bitterfeld) and Matthew of Cracow. After the battle of Lipany in 1434, in which the moderate Hussites united with Roman Catholics defeated the radical Hussites,a compromise with the Roman Church and the Emperor and crowned Bohemian King Sigismund could have been realized. The compromise led to reconciliation of the Bohemian reformed mainstream with the Roman Church. The text of Compactata based on the Four Articles of Prague was accepted by the Czech (Bohemian and Moravian) political representation as well as by the Council of Basel, but the Pope refused to recognize it. The Bohemian Utraquist Church was an autonomous ecclesial body emerged in Bohemia and Moravia, that viewed itself as a part of the one, holy, catholic Church, but that remained in a merely formal communion with the Roman pope. During all of the fifteenth century it maintained an ambition to serve as a vanguard of reform for all Western Christendom. For a long time, this church – schismatic from the Roman point of view – remained a unique phenomenon in Europe. 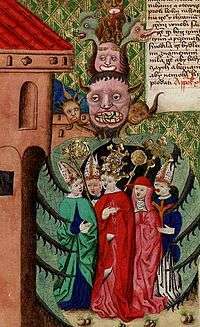 Until 1471, the church was led by the elected Archbishop of Prague, Jan Rokycana, who was never confirmed by the Holy See. After his death it was led by the Utraquist Consistory headed by the administrator. The Utraquist Consistory had its seat in the Old Town of Prague. The church continued to recognize the apostolic succession in the Roman Church, and insisted on the ordination of its clergy by "proper" Catholic bishops. 1 2 3 Atwood, Craig D. "Czech Reformation and Hussite Revolution". www.oxfordbibliographies.com. Oxford Bibliographies. Retrieved 10 January 2016. 1 2 "Kruh českých duchovních tradic". veritas.evangnet.cz (in Czech). VERITAS – historická společnost pro aktualizaci odkazu české reformace. Retrieved 8 September 2014. ↑ Soukup, Miroslav (2005). "Cesta k české reformaci" (PDF) (in Czech). Ústí nad Labem. Retrieved 7 September 2014. ↑ "Turistická cesta valdenské a české reformace" (PDF) (in Czech). Veritas. 2005. Retrieved 7 September 2014. ↑ Morée, Peter C. A (2011). "Česká reformace u nás v cizině". www.christnet.cz (in Czech). Retrieved 8 September 2014. 1 2 3 4 5 Nodl, Martin (2010). "Summary". In Horníčková, Kateřina; Šroněk, Michal. Umění české reformace (1380–1620) [The Art of the Bohemian Reformation (1380–1620)]. Praha: Academia. pp. 530–531. ISBN 978-80-200-1879-3. ↑ Bělina, Pavel et alii, ed. (2012). "Duchovenstvo v Českých zemích". Kronika Českých zemí (in Czech) (4., aktualiz. vyd. ed.). Praha: Fortuna Libri. p. 177. ISBN 978-80-7321-651-1. 1 2 3 Nodl, Martin (2010). "Česká reformace [Bohemian Reformation]". In Horníčková, Kateřina; Šroněk, Michal. Umění české reformace (1380–1620) [The Art of the Bohemian Reformation (1380–1620)] (in Czech). Praha: Academia. pp. 20–23. ISBN 978-80-200-1879-3. ↑ Hledíková, Zdeňka (2009). "Karel IV. a církev". Svět české středověké církve (in Czech). Praha: Argo. pp. 179–180. ISBN 978-80-257-0186-7. ↑ Holeton, David Ralph (2010). "Liturgický život české reformace". In Horníčková, Kateřina; Šroněk, Michal. Umění české reformace : (1380–1620) (in Czech). Praha: Academia. pp. 219–220. ISBN 978-80-200-1879-3. ↑ Pekař, Josef (2011). Dějiny naší říše (se zvláštním zřetelem ke královstvím a zemím v říšské radě zastoupeným) (in Czech) (2. opr. vyd. ed.). Praha: Nakl. Elka Press. pp. 67–68. ISBN 978-80-87057-11-7. ↑ Čornej, Petr et alii, ed. (2001). Kdy, kde, proč & jak se to stalo v českých dějinách : 100 událostí, které dramaticky změnily naši historii (in Czech). Praha: Reader's Digest Výběr. p. 107. ISBN 80-86196-33-X. ↑ Šmahel, František (2013). 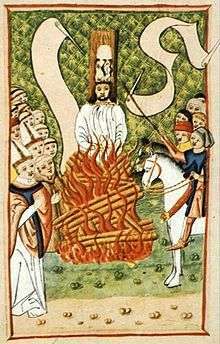 Jan Hus : život a dílo. Praha: Argo. p. 143. ISBN 978-80-257-0875-0. ↑ "Magistri Ioannis Hus appelatio ad supremum iudicem". etfuk.sweb.cz. Retrieved 23 July 2015. ↑ Cf. Williamson, Allen. "Joan of Arc Letter of March 23, 1430". Joan of Arc Archive. Retrieved 26 January 2015. ↑ Gillett, E. H. (1864). The life and times of John Huss: or, The Bohemian reformation of the fifteenth century. Band 2. Boston: Gould and Lincoln. p. 437. Retrieved 26 January 2015. ↑ Mullett, Michael (2010). Historical dictionary of the Reformation and Counter-Reformation. Lanham, MD: Scarecrow Press. p. 34. ISBN 978-0-8108-7393-3. Retrieved 26 January 2015. 1 2 3 Hlaváček, Petr (2007). "Confessional Identity of the Bohemian Utraquist Church: the transfer of priests from the sub una to the sub utraque obedience". The Bohemian Reformation and Religious Practice. Volume 6 (PDF). Prague: Academy of Sciences of the Czech Republic. p. 209. ISBN 80-86675-11-4. Retrieved 4 January 2015. Brown, M. T. (2013). John Blahoslav – Sixteenth-Century Moravian Reformer Transforming the Czech Nation by the Word of God. Bonn: Verlag für Kultur und Wissenschaft. ISBN 978-3-86269-063-3. David, Zdeněk V. (2003). Finding the middle way : the Utraquists' liberal challenge to Rome and Luther. Baltimore (Md. ): the J. Hopkins university press. ISBN 978-0-8018-7382-9. Fudge, Thomas A. (1998). The magnificent ride : the first reformation in Hussite Bohemia. Aldershot: Ashgate. ISBN 978-1-85928-372-1. Fudge, Thomas A. (2010). Jan Hus Religious Reform and Social Revolution in Bohemia. London: I.B. Tauris & Co. ISBN 978-0-85771-855-6. Fudge, Thomas A. (2016). Jerome of Prague and the Foundations of the Hussite Movement. New York: Oxford University Press. ISBN 9780190631550. Gillett, E. H. (1863). The life and times of John Huss: or, The Bohemian reformation of the fifteenth century. Volume 1. Boston: Gould and Lincoln. Gillett, E. H. (1864). The life and times of John Huss: or, The Bohemian reformation of the fifteenth century. Volume 2. Boston: Gould and Lincoln. Grant, Jeanne (2014). For the Common Good : The Bohemian Land Law and the Beginning of the Hussite Revolution. Leiden: Brill. ISBN 9789004283268. Kaminsky, Howard (2004). A history of the Hussite revolution. Eugene, Or. : Wipf and Stock Publishers. ISBN 978-1-59244-631-5. McBride, Stephen Turnbull ; illustrated by Angus (2004). The Hussite Wars 1419–36. Oxford: Osprey Publishing Ltd. ISBN 978-1-84176-665-2.